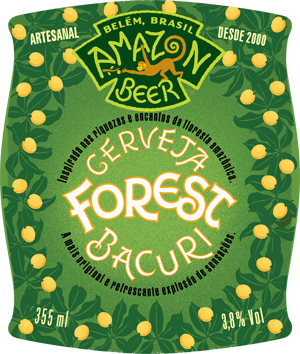 Forest Bacuri won a bronze medal at the 2014 International Beer Challenge in London. A pale bronze beer with a pungent aroma of pulp fruit, sweet and yet spicy, with rich malt notes and gentle hop resins. A fruit jelly flavor dominates the mouth with a spicy edge, juicy malt and light hops. Pepper notes develop in the finish, balancing the rich fruit and malt. The 3.8% beer has a lingering savor and is beautifully refreshing. Amazon specializes in beers with an added local ingredient. In this case, it is bacuri, a rainforest plant with a sweet-and-sour taste. The result is a bright golden beer offering a peppery aroma of gentle herbs, lemon and root ginger. The taste falls on the sweet side and is softly spicy, with flavors of lemon, lime and slightly earthy root ginger, but without the warmth. As the finish dries, it becomes more bitter and perfumed, with lemon and ginger flavors lingering. Sure, there’s an element of Sprite or 7Up about this beer, but it’s very refreshing nonetheless.